What this showed, to take one example, was that men and women in Cann Hall at that date were likely to die 5.3 years and 4.4 years earlier that their equivalents in Endlebury. For a short while, such figures were also at the forefront of public debate, but subsequently they slipped from view. Recently, however, the subject has been referenced again, and what follows recounts the story that has subsequently unfolded. On 28 January 2017, Councillor Ahsan Khan, Cabinet Member for Health and Wellbeing, visited the Cann Hall Community Ward Forum and noted in the course of a wider presentation that ‘Endlebury Ward has the highest life expectancy rates within the Borough’, while ‘Cann Hall Ward has the lowest life expectancy rates in the borough’. 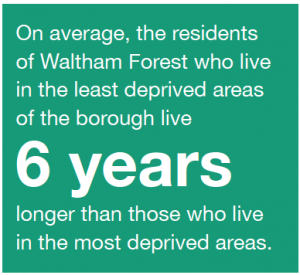 On 30 January 2019, the NHS Waltham Forest Clinical Commissioning Group (CCG) was asked to supply what information it held on ‘life expectancy rates in Waltham Forest, both at borough level, and broken down by ward’. On 30 January 2019, LBWF was asked for the source of Cllr. 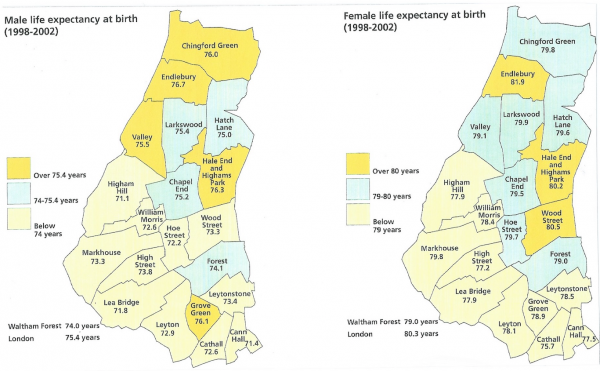 Khan’s minuted comments, and ‘any other material that LBWF holds on life expectancy rates for men and women in the borough, both as a whole, and broken down by ward’. ‘There was no specific work produced for that meeting – the council did not provide this. The Councillor must have got that information elsewhere’. As to the ‘any other material’, that was ignored. On 25 February 2019, Cllr. Khan was asked directly (though under the Freedom of Information Act) about where he had obtained his figures. /lifeexpectancyatbirthandatage65bylocalareasuk (life expectancy by Local Authority)’. 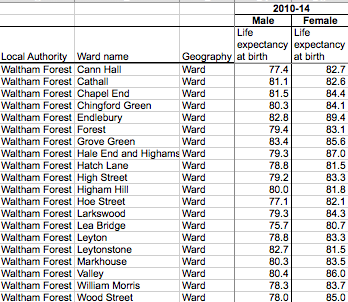 On 12 March 2019, a Freedom of Information Act request to LBWF posed the obvious question: ‘Life expectancy rates in the borough vary by ward, with the poorer wards markedly lagging the richer. Please will you state how LBWF is currently addressing this unsatisfactory situation, and forward copies of any written policies that may be involved?’. Following the link, the Health and Wellbeing Strategy turns out to be a feel-good document, which promises progress on 41 different metrics, ranging from ‘admissions due to falls and fractures’ and ‘vaccination rates and infectious disease spread’, through ‘teenage pregnancy’ and ‘child poverty’, to ‘complaints about noise’, ‘proportion of homes which are affordable’ and ‘inequalities in outcomes by “protected characteristics”‘. On 15 March 2019, LBWF was asked: ‘(a) what specific policies have been or are being adopted under the aegis of the joint Heath and Wellbeing Strategy 2016-20 to mitigate varying life expectancy rates in local wards; and (b) what these policies have so far achieved?’. ‘a) There is no specific policy aimed primarily at reducing variation in life expectancy by ward. However, much of the work done under the Health and Wellbeing Board will include aims around reducing health inequalities, which includes life expectancy. All reports to the Health and Wellbeing Board are publically available. Examples of this could include the recent strategies around Healthy Weight, Substance Misuse, Mental Wellbeing and Suicide prevention. b) LBWF does not hold information on life expectancy by ward, but instead uses publically [sic] available national information from PHE and ONS. As ward level life expectancy is only available for 5 year periods, and is only available over a year in arrears, the impact of the Health and Wellbeing Strategy on life expectancy would not begin to be apparent until 2023 (when the 2017-2021 information will become available)’. Over the years, LBWF and its partners have moved to what might be termed a broad-brush approach to healthcare, concentrating on improving a range of specific metrics as they manifest themselves across the borough as a whole, and in the process largely disregarding variations that occur at a more local level. But whether this change of emphasis is sensible in terms of outcomes for residents – especially poorer residents – is questionable. One assumption that underpins the current approach – often unspoken – is that healthcare provision and resources are evenly spread, so that, for example, regardless of postcode, everyone can readily access the kind of treatments that they need. However, currently it is difficult to establish that such equality of access is being achieved. The published data in relation to the location of health professionals is thin, while what exists hardly reassures. An example is illustrative. In a recent report to the Health and Wellbeing Board, the aforementioned Jonathan Cox noted that there were 60 community pharmacies in Waltham Forest, and added that while there was at least one in ‘all localities’, there were a greater number of pharmacies per head of population in the ‘south’ than the ‘north’ – given that the former is generally considered to be the poorer cousin, for sure a happy outcome. So far so promising. But in the discussion that followed, it emerged that numbers alone failed to tell the whole story. Community pharmacies, it was noted, did not all offer the same provision, nor did they charge the same prices. Though some helped people manage their medicines, others did not. And so on. What appeared to be a straightforward matter turned out to be anything but, leading the Board to agree that ‘the discussion had given rise to some interesting points that deserved further exploration’. In other words, equality of access remained unproven. A second objection to the broad brush approach is that it ignores evidence that key factors which often trigger ill-health, like unemployment, low income, and poor housing, tend to be much more concentrated in some parts of the borough than in others. The Index of Multiple Deprivation published in 2015 (IMD 2015) – the most recent in this series – looked at every English neighbourhood (that is, subsections of wards, or in the jargon ‘Lower layer Super Output Areas’ (LSOAs)), and ranked them according to how they were faring in terms of 37 separate indicators across seven distinct domains of deprivation. Of course, IMD 2015 has become dated. Indeed, in the four years since it was completed, the borough has changed quite significantly, shaped both by immigration and growing affluence. But that said, IMD 2015’s key lessons – that areas of significant deprivation persist, and that ‘place’ cannot be ignored in understanding ill-health – certainly remain relevant. Quite why LBWF seems to have increasingly overlooked these points remains unclear. Perhaps the fact that the government, too, has moved away from a ward-based approach to deprivation has proved decisive. But the suspicion remains that the explanation lies much closer to home – that in the rush to transform the borough so as to attract the better off (as described in previous posts, the key driver of so much current council policy) the whole issue of deprivation has been downgraded, shunted into a cul-de-sac, so as not to intrude on the glamorous business of cavorting with big property developers. And that, needless to say, is a great shame.